The Hanioti Village Resort is located on the peninsula of Kassandra, eastern side, in the region of Halkidiki, Greece. The 3-star Hanioti Village Resort is smart and modern and surrounded by beautiful green pine forests, lovely beaches and crystal blue sea. Couples and families are invited to indulge in 42 well-equipped twin rooms and suites and relax and unwind in great Spa and fitness facilities and laze around the sparkling pool. The dining options include ingredients fresh from the onsite organic garden and the lounge bar hosts a variety of entertainment and theme evenings. 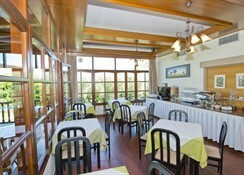 Book into the Hanioti Village Resort and succumb to friendly Greek hospitality. Getting to the hotel: 90km to "Macedonia" Thessaloniki International Airport. 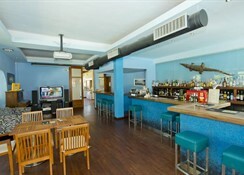 Local tips: The hotel is located 800m from Haniotis town centre, 250m from Haniotis beach, 500m to the supermarket and 300m from a bus stop. Moudania Port is 35km away. There are plenty of cultural sites around Hanioti to be visited, including Turtle lake near Polychrono, the home of the Testudinata Turtle, Sanctuary of Poseidon in Posidi, the traditional town of ancient Afytos and the ancient site of Mendi in Kalandra. 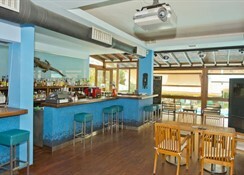 Food, drink and entertainment: "Lazy Croc" Lounge Bar & Cafe hosts special events including BBQs, karaoke nights, movie nights and live music, and provides Greek and international dishes comprising ingredients from the organic garden; small dining hall; meals are served in the dining hall, the bar or the pool bar; TV lounge; pool bar with deckchairs & parasols. Sport, games and activities: Swimming pool with sun terrace and gardens, loungers & parasols, Wellness Spa & Gymnasium includes: Jacuzzi, sauna, Hammam steam room, heated relaxation lounge, relaxation area, massage room and nail bar, and provides a range of massage therapies; garden area and beach access with water sports/fun. Additional: Reception Services (6.30am-02.30am), housekeeping, internet access, first aid services, Doctor's office (800m away), currency exchange, laundry service, fax service, car rental service, safe boxes and onsite parking spaces available.